No need for such vigor. I don’t understand the hatred for your own old work. We all started somewhere. Should feel proud that you improved instead of ashamed you weren’t always skilled, that’s just silly. Oh no don’t get me wrong haha. I know we all started somewhere and yes it’s rad to see I’ve made strides. It’s not that I’m ashamed it’s just like. That’s old work, I don’t want it posted anywhere anymore I guess haha. It just felt weird to see some one posting my fledgling years’ work around haha. Also I JUST noticed that centaur sheet wowee. Der’s weapon designs are HANDSOME. If you those weapons are radical, you should see the Emperor. Wewlad. Heh, thank you, man. I’m always happy to see my work full of improvements, creativity and praise. Like Pik said, Emperor is gonna be great. @DerTheVaporeon you go make more animation of semi-humans and laguz? 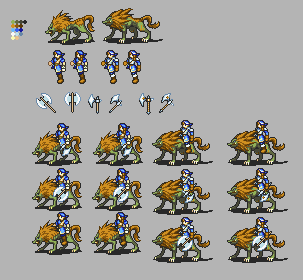 No plans for semi-humans or laguz, but I have been pretty busy in a thing as of lately. Isn’t that Viking Berserker and Wolf Rider? Where did you get these? How did you get these? From whom did you get these? Let these stills sink in as to how I am progressing. 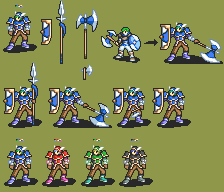 All of it is done, but I have yet to do all of Durandal and Basilikos. Here’s the T2 for the Huskarls… uhh… I was thinking between Viking and Einjerhar. Same ability to reduce Bow damage, but also coupled up with the ability to reduce magic as well. Uses Lances and Axes. Updated thread info with them. 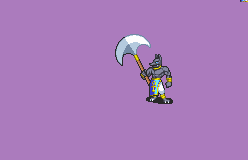 Winner of Second Place in the previous Battle Sprite Contest. And sure, some randos because why not? A edit of the Necromancer. Somewhat WIP. A rework of Skitty’s Female Warrior, I think. I might wanna delete this, if this isn’t free to edit. Because I thought that the spiky shoulderpad was too much for a female version and they also lacked the spiky headband from the FE Girls variant. And finally how Motomiya views Zhang Fei in his RotTK-based manga, Tenchi wo Kurau. Nice Solid Snake sprite, Der. Don’t ask me why there’s no pirate, but there’s a little big plan with one of these. Meanwhile, some kiddo wants you. 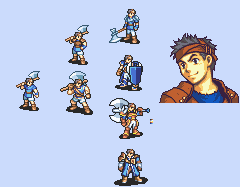 Hero and Hector ones look good, not sure what the bottom one is supposed to be though.